Following many months of speculation, information has now reached us that Merseytravel have finally sold Blackpool Brush Railcoach 626 which was removed from its long-term resting place at the Pacific Road complex on the Birkenhead heritage tramway earlier this month. Unfortunately, hopes that 626 would enter preservation have now been dashed; instead it has been bought by Peel Holdings for possible use in connection with local development plans. In light of the disposal of many traditional Blackpool trams as the tramway’s light rail upgrade loomed, 626 and four other single deck cars were purchased by Merseytravel but the firm’s intended takeover and expansion of the Birkenhead tramway never materialised. Whereas the other four have been in outside storage since leaving Rigby Road, 626 has been luckier and spent most of the time hidden away in the Pacific Road depot since its arrival at Birkenhead in August 2010. 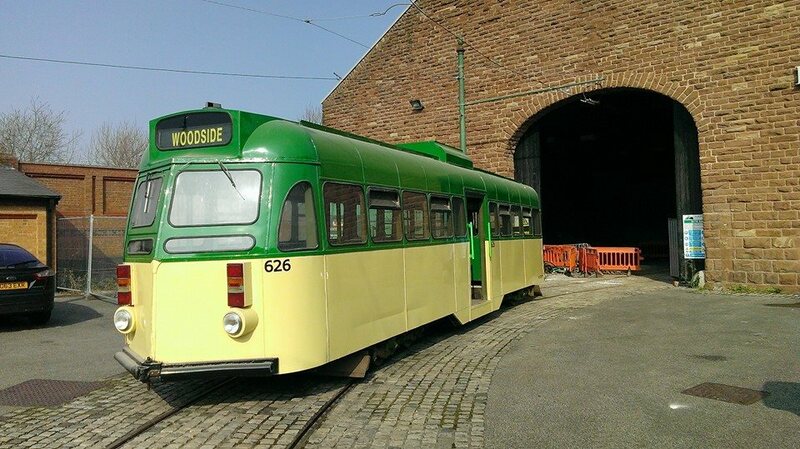 It has operated a few clearance tests and the like but never carried passengers there and hopes that the Merseyside Tramway Preservation Society might adopt it ultimately did not happen due to a lack of space at their own premises at nearby Taylor Street. Enter Peel Holdings, who are behind the ambitious Wirral Waters regeneration scheme to revitalise the local area. In spite of previous belief, it now seems that they remain hopeful that a tramway could serve the new development at some point in the future and, with 626 being in a generally good condition following a major rebuild in the 1990s, they have decided to buy the tram from Merseytravel. In secret it was extracted from Pacific Road and transported away from the tramway on Thursday 14th May, and is believed to have been transferred to a new storage site not far from where it was previously housed. This leaves Pacific Road devoid of trams, as is understood to have been requested by the building’s new owners, although as tracks remain in situ the possibility of a future display incorporating a static tram cannot be totally ruled out. The fate of the other four Blackpool trams owned by Merseytravel – Brush cars 625 and 637 and trailer cars 681 and 687 – is not as yet known, although it is understood that the Fleetwood Heritage Leisure Trust have been to inspect them and may be interested in buying some or all of the quartet. The tram track which had been acquired by Merseytravel for potential use in connection with the Wirral Waters development has also been sold and distributed between a few different locations, meaning that if Peel Holdings do decide to go ahead with their tram plan, they will presumably need to replace it which is unlikely to come cheaply! This entry was posted in Birkenhead Heritage Tramway. Bookmark the permalink. Such a shame it couldn’t have run at Birkenhead (I believe the reason was mainly political agreement!) but at least it has escaped the scrapman and we may one day see it gracing new rails. Blackpool had the opportunity to buy it back for a reasonable price, but they didn’t. Anyone who wanted to buy 626 can’t really complain as it was first offered for sale several months ago! I agree entirely with Andrew. The tram was advertised for sale for several months, as reported on all the main Internet sites, along with contact details. Anyone could have made a bid on the tram, purchased it and then donated it back to Blackpool or to another heritage line. It sometimes amazes me that people think companies should just give assets “back”. I was involved in bus preservation a few years back and people used to comment about, amongst other things, the livery “I would have done this”, or “I would have done that…” well if you pay the price I’d paint it bright red with yellow dots! Besides, I don’t think Blackpool needs another Brush Car, they have three already! I Bet. I’ve never been involved with Railway Preservation myself, but I can imagine its the same. Personally since it is in good condition I hope a home for it can be found for 626. I think though we need to be realistic when it comes to preservation. A time will come when the museums will have all the cars that they need and some of the Blackpool cars will become duplicates or even triplicates. Maybe what is needed is to accept we cannot wast time and money saving every car and concentrate our efforts on more worthwhile projects. For example BHT is doing a fantastic job, but every £ spent on saving yet an other brush/ balloon etc is a £ less that could be used on other projects such as OMO 8, standard 143 etc.